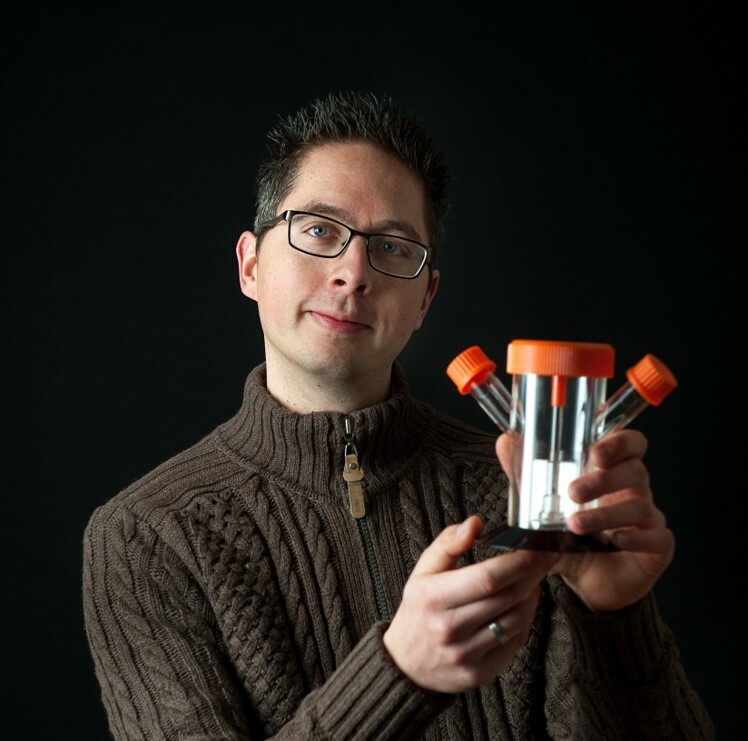 Meet the expert: Matthijs, Bioprocess Scientist. Cells derived from mammalian species and cultured under artificial laboratory conditions have been used to produce complex biological products. As such cells normally grow as a tissue, most available artificial mammalian cells are originally surface-dependent and therefore are called adherent cells. Adherent cells will only duplicate and produce a desired product when attached to a surface. Hereto, traditionally scientists have used so called roller-bottle and cell-factory formats but these systems are unfortunately very labor intensive, need lots of floor space, allow limited process control like pH and Dissolved Oxygen and are poorly scalable. Therefore, these traditional formats are less favorable for a commercial manufacturing process. It is for this reason scientists have developed cell lines capable of growing in suspension. However, in some cases cell lines like MDCK and VERO are not fit for commercial manufacturing due to phenotypic changes of the cells leading to either tumorigenicity or lack of productivity. A good alternative has been the development of micro-carrier based processes for these types of cells. Micro-carriers are beads to which adherent cells can attach and thereby retain their ability to proliferate and produce product. Owing to micro-carriers it is possible to grow adherent cells in stirred bioreactor systems. The use of micro-carriers results in an increased cell culture area, reduced labor, and a reduction in floor space, which in turn results in significantly lower Cost of Goods compared to the traditional roller-bottle or cell factory formats. Furthermore, due to a much improved process control with micro-carriers in stirred tank bioreactors as compared to the traditional systems, production output can be monitored and tweaked. To develop a micro-carrier based cell culture process requires fine tuning of the different process parameters which is an expert job. A good balance between working volume, pH conditions, Dissolved Oxygen and shear stress are pivotal to name but a few parameters. Thus, to develop a micro-carrier based cell culture process requires an experienced team, but once optimized, such a process can be smoothly applied in a scalable bioreactor process up to 1,000 L.
There have been a number of important advances in micro-carrier based cell production tools and technology. For instance, new surface materials have been developed that allow for better cell attachment, such as biomimetic surfaces. Other materials have been tested and introduced as well, such as temperature-sensitive surfaces that allow more efficient ways to release adherent cells from the micro-carriers and re-attachment of the cells to new micro-carriers. This process of release and re-attachment is critical for cell scale-up to large bioreactor volumes or during product harvesting. Other notable improvements, are innovations in cell culture media, like the availability of animal component free and thereby very safe raw materials. That said, the optimal production method is known to vary per cell type, product and production scale and therefore needs attention to move from bench to clinic. As there are many factors to consider with the development of an adherent cell culture-based production process, Batavia Biosciences deems it essential to first employ a small scale high throughput screening platform in combination with a Design of Experiments (DoE) approach. This tool allows high throughput optimization of critical parameters with minimal amounts of material prior to scale up to a robust process. Using these tools, my team at Batavia Biosciences was able to develop a novel production process with an increased production output (2-fold), reduced footprint (4-fold) and reduced CoGs (2-fold), which has proven itself to be robust for scale-up to commercial production. As the starting point in this project was a T-flask based adherent cell culture process, my team was proud to be spearheading this project and delivering on set improvements. As a company dedicated to help bringing biopharmaceuticals to the market at higher speed, with reduced cost, and with higher success rate, Batavia Biosciences has vast experience in transferring adherent cells to micro-carriers. Consider this a viable option for your adherent growing cell line that produces your high value product. With our team of experienced researchers, using the newest technologies and techniques, we are well equipped to take on any challenge associated with adherent cell culture.